On an unseasonably balmy January evening, the Ed Mirvish Theatre was full of sparkling frocks, excited children and classy adults, all waiting expectantly for Mirvish’s North American premiere of the Andrew Lloyd Webber revisit of The Wizard of Oz. It’s hard to take something that’s so ingrained in the canon of popular culture, pour a can of oil over its already aptly functioning hinges and expect to make good of what already works. Harder still, I think, to try and do that with something that’s already taken off in tangents and explored in more dynamic and – personally – interesting ways. 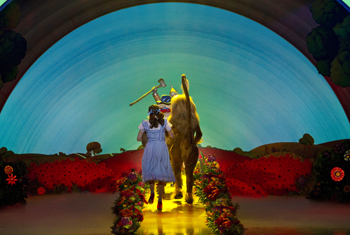 I’m not sure why Andrew Lloyd Webber thought it would be a good idea to revisit L. Frank Baum’s glorious Oz, I’d even venture and say he’s a bit late to hitch his caboose to the bandwagon, but I was eager to see what he could bring to the table that hasn’t already been explored. Truth be told, there isn’t much. Don’t get me wrong, I wasn’t expecting a completely different version of the story akin to Stephen Schwartz’s blockbuster Broadway hit Wicked, but I think it’s fair to say I was expecting a bit more than a near carbon-copy of the film version. The additional music is unfortunately the unmemorable kind, although with an already stellar book of iconic songs, I’m sure it was a daunting task for Webber and his team (including lyricist Tim Rice) to fill in the blanks. While the skeleton of the show itself is nothing special, I will concede to admit that the cast is really enjoyable to watch. I wasn’t aware of the CBC reality TV series Over the Rainbow until very recently, but I can see why Danielle Wade was chosen as Dorothy. The girl has pipes and she knows how to use them. She also embodies the vague essence of Miss Garland’s character without emulating her entirely, something which is probably not so easy to do as an actor. My other favourite was Jamie McKnight as the limber, heartwarming Scarecrow. He has some great one-liners and seems to possess an extra bit of energy that might’ve outshone the Tin Man and the Lion for most of the show. Lisa Horner’s Wicked Witch of the West is pitch perfect, but I couldn’t help but wish, for her sake, that Webber and his crew had added in a better song for her solo moment of glory. I think every good villain deserves a chart topping hit. I’d also like to throw a shout out to the entire ensemble, who I thought were absolutely fantastic and I wanted to see more of them. The choreography, supplied by Arlene Phillips, is dynamic and clever and fits really well. I do think that the dance envelope could’ve (and should’ve) been pushed a little further, especially with the Tin Man. Mike Jackson’s Tin Man wanders through Oz with tap shoes on and barely makes any use of them. The idea of a tap dancing Tin Man is such a great one, in my opinion, it was a big let-down to see that it wasn’t really used to the extent that it could’ve been. Robert Jones’s set and costume design are bright, colourful and dazzling enough to echo the beautiful look of the film, again, without emulating it completely. There is some clever staging involving a moving sidewalk-type yellow brick road and a multimedia element with video projections, specifically for the tornado scene and the looming face of the great and powerful Oz. As a show, plain and simple, it’s The Wizard of Oz live. It’s campy and fun, the children will love it – they might pee their pants at certain points, it does get a little frightening – but it would be much less expensive to see Judy Garland in action on the little screen, curled up on your couch with a bowl of popcorn.